With the expansion of the Phoenix light rail making its way towards South Phoenix, Fuerza Local along with LISC and GoDaddy Communities have teamed up to support local businesses in the South Central Corridor. Promote South Phoenix is a combined effort by these organizations that empowers local business owners by providing free business workshops and one-on-one coaching. The workshops are customized to meet the specific needs of South Central Corridor businesses in preparation for the light rail expansion into this area, so that they can succeed through and after construction. Our Fuerza Local business liaisons are working diligently with South Central Corridor business owners ensuring all their questions and concerns about the light rail are addressed. Tanairi, Mayra, and Jose on the Fuerza Local team along with LISC and GoDaddy assist business owners host events and market their business to attract customers and elevate their traffic. Our business liaisons had the opportunity to sit down with some of the business owners in the South Central Corridor and learn about them and their business. Here are four local businesses that are doing great things in the South Phoenix neighborhood. Azukar Coffee Shop is one of the newest businesses in South Phoenix. On Saturday, August 19, they had their grand opening and it was filled with the aroma of fresh coffee, natural drinks such as cold lemonade and horchata and mouthwatering tacos catered by Ni De Aqui Ni de Alla, a local taco truck. I experienced their signature drink, Horchata Cold Brew, that reminded me of some of my favorite tastes of Mexico. Sandra Flores, who owns Azukar Coffee Shop, was born and raised in South Phoenix. She is proud to own a home with her husband in the same block they both grew up in, staying close to family and friends. “That block holds my mom’s house, my husband’s parents’ and grandparents’ house, our “ comadre’s” house, so we’re pretty invested in this community,” she says. Her passion to start a coffee shop dates back to the days when she was in school and recalls doing homework in various coffee shops across the valley. Her mission is to create a community space that youth can utilize to do school work, professionals’ can host meetings, and community members can use as a second home. You will also experience unique art on the walls by local artists. Sandra will always greet you with a smile and make each coffee with an important ingredient - love! Raspados Dulce Vida was born out of a passion to pursue financial freedom and have the opportunity to spend quality time with family. This dream began with two sisters and a husband that teamed up to form a Mexican style snack location. Edith and her husband, along with her sister Sarahi, chose South Phoenix as their location because both families grew up and currently live in South Phoenix. As first generation Mexican-Americans, they are beating the odds by becoming business owners and creating jobs within our community. As you walk into Dulce Vida you are welcomed by the smells of mango, cirgüela, and piña along with other natural fruits used to flavor the delicious raspados. In here you can fulfill all of your cravings from cold ice cream to tostinachos which are made of Doritos with green salsa flavor, white corn, nacho cheese, and jalapeños. The vibrant colors create a happy environment to enjoy treats. All of the renovations, updates, painting on walls were done with the efforts of all three owners. Dulce Vida opened their doors on January 12, 2017, to the South Phoenix community located in the popular South Plaza. Nearing their first year anniversary since the grand opening, you will still witness the warm welcome and smiles from both sisters Edith and Sarahi. From the moment you enter the restaurant Mrs. Mariscal greets you with a smile and asks, “I have not seen you before, is this your first time here?” and, “How did you hear about us?” She is very eager to get to know personally each and every person that walks through her doors. She shared with me that most of her new customers are going to Las Gloria’s due to word of mouth from a family member or friend that had delicious food and a pleasant experience. Returning clients keep coming back because of the delicious food, environment, or their parents had been going there for years. Mrs. Mariscal firmly believes that in order to be successful, the business owner has to be there personally greeting her customers and training her staff to do the same. “Thanks to my customers, I am able to feed my family and the families of my employees,” said Mrs. Mariscal. The expectations are high for herself and employees. She makes sure that the restaurant is spotlessly clean and the food is correctly cooked and to the standards of her customers. The murals on the walls of her restaurant are retouched when needed. Mrs. Mariscal has invested in her restaurant to make sure it has an aesthetic look from the inside and outside of the restaurant. Being in her restaurant and personally seeing her greet all her customers, her determination and providing the best possible experience is inspiring. Established in 1989, Botas Juarez has been the place to get your western wear in South Phoenix. Having been in business for more than 28 years, owners Hilda and Miguel Peña are passionate about taking their business to the next level. As a business owner, it's always important to be aware of the culture shift in clothing and which platforms consumers use to buy clothing. Both Hilda and her husband have made it their task to adapt and keep up with the changes to continue having a successful business. One of their initiatives came when they contracted with city workers to make Botas Juarez the preferred place to buy their boots. Using this type of promotion and forging connections within the community is helping their business thrive. Botas Juarez is also one of the few western wear clothing stores to offer 501 Levi’s that customers love. Listening to customers is key to keep them coming because this is one of the places they can find what they are looking for. Con la expansión del tren ligero a el sur de Phoenix, Fuerza Local, LISC y GoDaddy Communities se han unido para poder apoyar los negocios locales en el corredor central del sur de Phoenix. El programa de Promover el sur de Phoenix es un esfuerzo colaborativo que ofrece talleres de negocios gratis y asesoría personalizada, empoderando a los propietarios de los negocios locales en el corredor central. Los talleres son modificados y se concentran en a las necesidades de los negocios en el corredor central en preparación para la construcción del tren ligero. El objetivo es atraer más clientes y promover exito a traves de la construcción. Nuestros enlaces de negocios de Fuerza Local están colaborando diligentemente con negocios en el corredor central enfrentando y clarificando todas sus dudas y preguntas relacionadas a la construcción del tren ligero. Tanairi, Mayra, y José de Fuerza Local, con la ayuda de LISC y GoDaddy, asisten a los empresarios de esta área a organizar eventos y promover sus negocios para atraer más clientes y apoyar la comunidad. Nuestros enlaces de negocios tuvieron la oportunidad de entrevistar algunos de los propietarios en el corredor central para aprender sobre ellos y sus negocios. Los siguiente cuatro negocios locales son algunos de los negocios contribuyendo a la prosperidad de el sur de Phoenix. 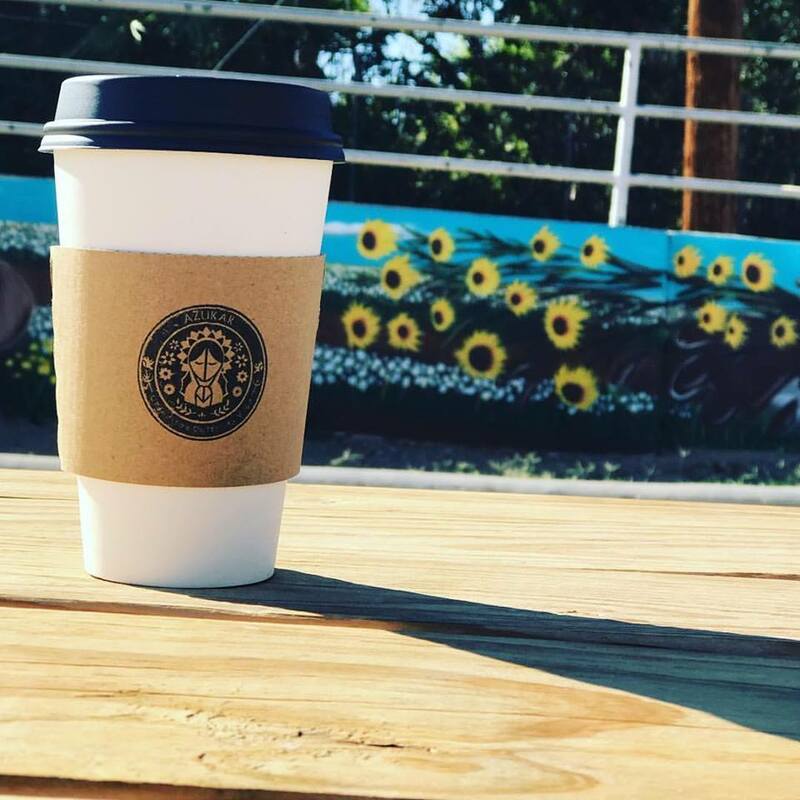 Azukar Coffee Shop es uno de los negocios más nuevos de el sur de Phoenix. Tuvieron su gran apertura el sábado 19 de agosto y el aroma de café fresco llenaba el todo la cafetería y también había jugos naturales y para comer tacos de la troka Ni De Aqui Ni de Alla. Nosotros probamos la bebida emblemática de Azukar Coffee Shop, la Horchata Cold Brew, y cada probada nos recordó de los sabores ricos de México. La propietaria de Azukar Coffee Shop, Sandra Flores, nació y fue creada en el sur de Phoenix. Vive con su esposo en las misma comunidad donde los dos fueron creados, manteniéndose cerca a familia y amigos. “En esa cuadra está la casa de mi mamá, mis suegros, abuelos, y comadre, asi que somos miembros instalados de la comunidad” dice Sandra. Su pasión de iniciar una cafetería recorre a los días de estudiante cuando Sandra hacía su tarea en cafeterías por toda la ciudad. Su misión es crear un espacio comunitario donde estudiantes puedan llegar y hacer tarea, o donde profesionales pueden tener juntas y donde miembros de la comunidad pueden sentirse en casa. La cafeteria tambien celebra exposiciones de arte contribuido por artistas locales. Sandra recibe a todos con una sonrisa y crea una experiencia con cada taza de café. Raspados Dulce Vida nació a raíz de una pasión por alcanzar la libertad financiera y la oportunidad de pasar más tiempo con familia. Este sueño comenzó con dos hermanas y un esposo que colaboraron y formaron una nevería estilo Mexicano. Edith y su esposo, con la ayuda de su hermana Sarahi, decidieron abrir su neveria en el sur de Phoenix porque ambas familias fueron creadas en el sur de Phoenix y aún residen ahí. Como primera generación Americanos de ascendencia Mexicana han demostrado fortaleza en tiempos difíciles para negocios pequeños y de propiedad hispana. Al entrar a Dulce Vida, el olor de mango, ciruela, y piña te invitan a disfrutar raspados de frutas naturales. Pueden satisfacer cada uno de sus antojitos incluyendo antojos de nieve o sabores no tan endulzados como Tostinachos. Los colores vibrantes creen un ambiente alegre para disfrutar los diferentes sabores. Todas las renovaciones y pinturas son esfuerzos realizados por los tres dueños. Dulce Vida abrió sus puertas por primera vez el 12 de enero del año 2017. Localizado en South Plaza en el sur de Phoenix, Dulce Vida recibe a sus consumidores con una experiencia cálida y una sonrisa. Jorge y Ruth Mariscal abrieron su restaurante Las Glorias el 4 de agosto de 1990. Una de las filosofías atribuida al éxito de Las Glorias es la calidad de servicio al cliente. La Señora Mariscal no ve a sus consumidores como clientes pero como familia, de hecho el anuncio frente su restaurante dice: “Mi Casa Es Su Casa”. Desde el momento que entras al restaurante eres recibido con una sonrisa. Jorge y Ruth normalmente preguntan “¿si es tu primera vez visitandolos?” y “¿cómo se enteraron de Las Glorias?” Son muy entusiasmados de conocer a todas las personas que entran al restaurante. La mayoría de las personas que van a Las Glorias son referidas por familiares o amigos. Siguen regresando por la calidad al cliente y el sabor superior de la comida. Muchas de esas personas tienen padres que también han regresado al restaurante por muchos años. La Señora Mariscal firmemente cree que para tener éxito en un negocio, el propietario/propietaria tiene que establecer una relación personal con los clientes y entrenar a sus empleados a hacer lo mismo. “Gracias al cliente, mi familia puede comer igual las familias de mis empleados” dice la Sra. Mariscal. Ruth asegura que el restaurante esté en condiciones perfectas y la comida cocinada bien al gusto del cliente. Los murales en la pared son pintados de nuevos cuando es necesario y la Sra. Mariscal ha invertido en mantener la apariencia del restaurante agradable. Su restaurante es un inspiración para todo tipo de empresarios, Las Glorias es un gran ejemplo. Botas Juárez fue establecido en el año 1989 y desde entonces ha vendido ropa estilo vaquero en el sur de Phoenix. Con más de 28 años de servicio local, Hilda y Miguel Peña tienen el deseo y la visión de elevar su negocio a nuevas alturas. Botas Juárez es una de las últimas tiendas de ropa que vende los famosos 501 Levi’s. Enfocándose en las necesidades de los clientes es clave para un negocio es por eso que Botas Juárez ofrece productos únicos y en demanda.